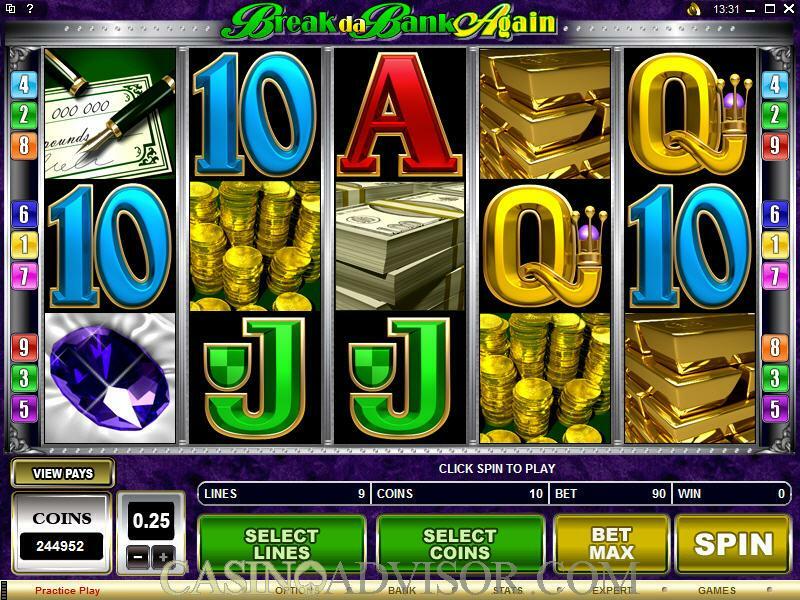 Break Da Bank Again is a colorful offering in the video slots category from Microgaming, which is generally regarded as the industry leader in gaming software for the online gambling market. 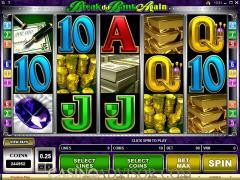 It is a five-reel, nine-line game, with a maximum wager of 90 coins. It is also a game with a multiplier and scatter, which act as triggers to bring players into the Free Spins Bonus Game and the Gamble Bonus Game, which enable players to increase and multiply their wins. On the left side of the interface, there is a button saying "View Pays," which offers a full breakdown of the jackpots and bonuses available in the game. Those payouts are very clear, even though of course there is not room on the screen itself for them while you are playing the game. You will see when you click to that screen that you can win up to 375,000 coins in this game. The "Break Da Bank Again" symbol is "wild," which means it can be used in place of any symbol for the purposes of completing a winning combination. And it operates as a 5x multiplier on that winning payout. However, a combination OF Break Da Bank Again symbols will not constitute a payout. The "Safe" symbol is a scatter, which means that it is can be credited toward a winning combination regardless of where it is positioned on any of the five reels. 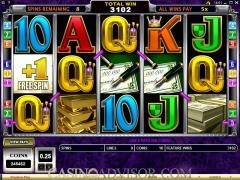 The entry to the "Free Spins Bonus Game" is when three or more "Safe" symbols are scattered anywhere on the five reels. And the degree to which you play that free spins depends on the number of Safe symbols you get. 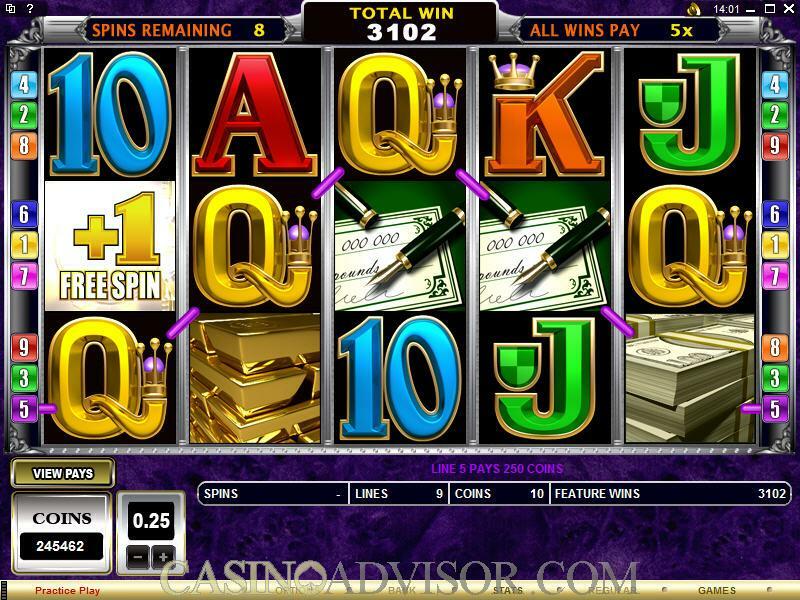 For example, three Safe symbols will bring you 15 free spins; four Safe symbols brings 20 free spins, and five Safe symbols produces 25 free spins. During the "Free Spins" phase, all regular payout rules apply, but the Break Da Bank Again symbol (a wild) will produce a 25x multiplier when it is used to complete a winning combo during this Free Spins Bonus Game. Interested in reading more detailed information about Break Da Bank Again? If so Click Here for more details.